The office of the District Attorney of Suffolk County has announced the entry of a guilty plea, conviction and sentencing of serial thief Richard Shiner by the Boston Municipal Court (BMC) on multiple counts of trespass, larceny and vandalism in local houses of worship, including St. Leonard and Sacred Heart Churches in the North End. Shiner has targeted St. Leonard Parish and other downtown religious sites in a series of recurrent crime waves dating back to at least 2010. His docket in the BMC clerk’s office recently listed more than 13 concurrent criminal cases pending, and scores of charges stretching over three decades. Shiner’s primary modus relies upon removing the contents of donation boxes and candle offerings with a wire smeared with a sticky substance to snare bills and gift envelopes. He has also resorted to the use of burglarious tools resulting in vandalism and damage by gouging and prying with sharp objects. 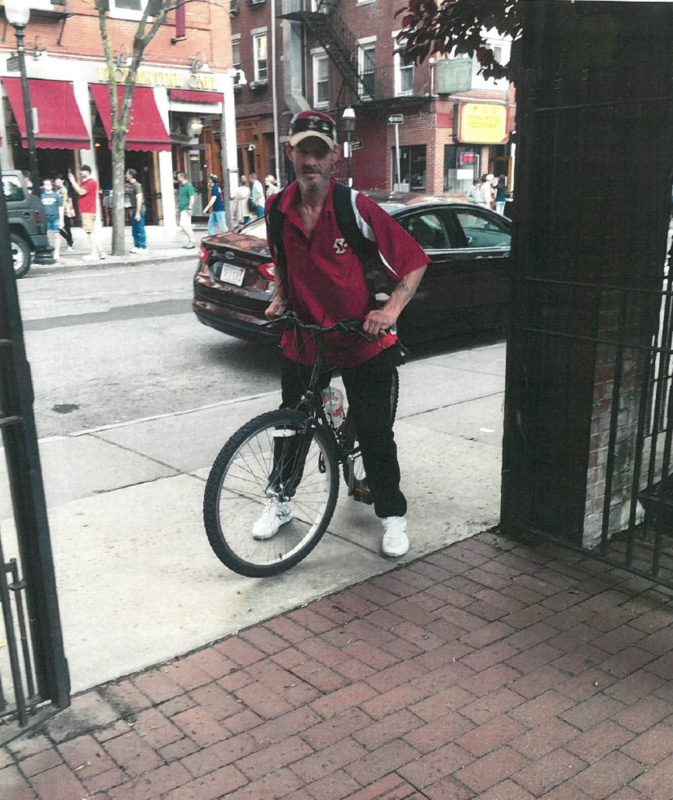 Shiner on bicycle at the Hanover Street entrance to St. Leonard Church. He has been filmed on close-caption camera and observed by eye witnesses repeatedly entering church premises after being served with criminal no trespass notices by Boston Police. Of concern to parish staff has been Shiner’s threatening and taunting behavior, including the use of obscenity when confronted. Concerned residents discussed the request for a stay away order at recent North End / Waterfront Residents’ Association and Neighborhood Council meetings. 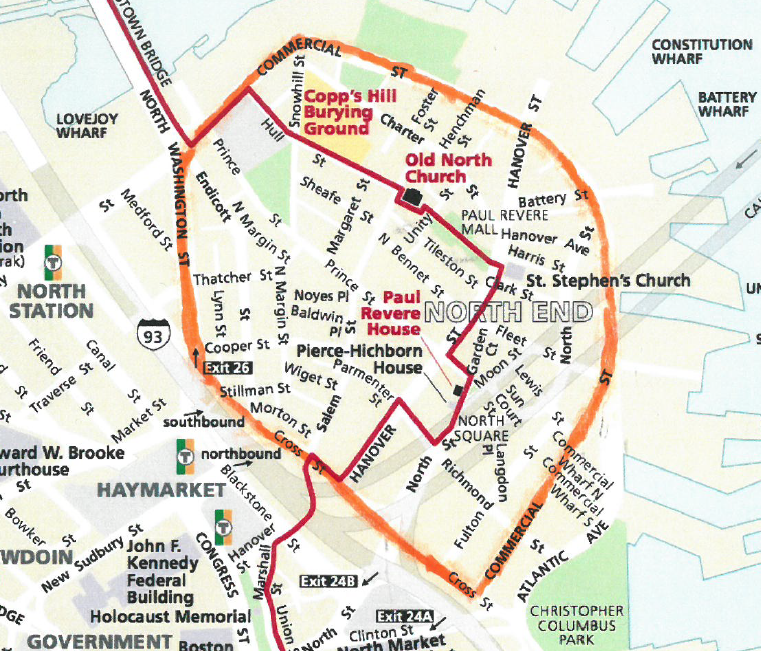 St. Leonard parishioners filed victim-witness documentation with the DA’s office and successfully pressed for this order, banning Richard Shiner from the North End neighborhood within a perimeter encircled by Commercial, Cross and North Washington Streets. The boundaries are clearly defined while not impeding the subject’s ability to travel on foot or by bike through downtown Boston or to otherwise have access to nearby parks and public amenities as long as he does not enter any side streets within the above-established zone. Shiner has been given a one-year suspended sentence in the house of correction with an 18-month probationary period. If he violates the stay-away order, he will face immediate incarceration without the commencement of new criminal charges, which he has successfully avoided and stymied with threats of self-injury and pleas for leniency due to his homeless state and addiction. 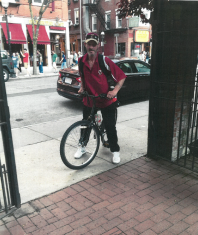 The public is asked to immediately notify Boston Police by 911-Call if Richard Shiner is observed in any part of the North End neighborhood within the boundaries of Commercial Street, Cross Street or North Washington Street. They are advised not to approach him since he has been known to carry sharp objects. Parishioners gratefully acknowledge assistance from Sergeant Stephen Moy of Boston Police District A-1, the office of Councilor Lydia Edwards and Assistant District Attorney Mariah O’Rourke. I believe Mr. Shiner is the man I see often outside St. Anthony Shrine. Very sad. Tom, Thank-you for your efforts into putting a stop to this ongoing theft and vandalism in our community. It takes alot of time and energy to protect our welcoming neighborhood from predatory behaviors of all kinds. We are lucky to have neighbors like you, as well as the support of Sgt Moy, Councilor Edwards, and Mariah ORourke DA. Thank you Tom for your diligent efforts. Congratulations on getting this done. And this is why Crime continues, he is laughing, howling with a year suspended sentence. 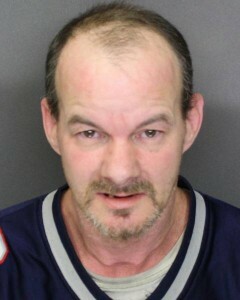 There is no price to pay if you commit a crime as this guy has done. You really think he is going to obey that stupid map ? In the summer, he will just blend in with the crowds. The liberal commonwealth. Just like the drunk college kids in the N.E. With all their incidents over the years, no one goes to jail. This guy is laughing.